○ “Designated Areas” are sea areas prescribed in items 2 to 4 of Article 33-6 of the Regulation for Implementation of the said Law (hereinafter the “Regulation”), or the so-called Tokyo Bay, Ise Bay and Seto Inland Sea including Osaka Bay. When ‘HNS’ tankers which is over 150 GT navigate in the Designated Areas loaded with ‘HNS’ in bulk, Ship Owners thereof have a legal obligation to deploy the materials and equipment and secure the experts which are necessary for ‘HNS’ prevention and cleanup at a location where it is promptly accessible to the site where the vessel is located.MDPC issues the Certificate of‘HNS’ Response Resource Deployment which certifies that MDPC has deployed the materials and equipment and experts on behalf of Ship Owners. In case of‘HNS’ spill incident caused by marine accidents such as collision, grounding and so on within the Designated Areas, MDPC will immediately arrive at the incident site and take quick and appropriate response at the request of the vessel issued with the Certificate. ※ The Emergency Response by MDPC shall not be continued more than 24 hours after its start. When there is a possibility of exceeding 24 hours, necessary response measures shall be consulted among the relevant parties such as whether they will continue or terminate operations, whether they will shift the Emergency Response to Item-2 Operation provided by Article 42-14 of the Law or to operations by any third party entrusted by Ship Owners, etc. 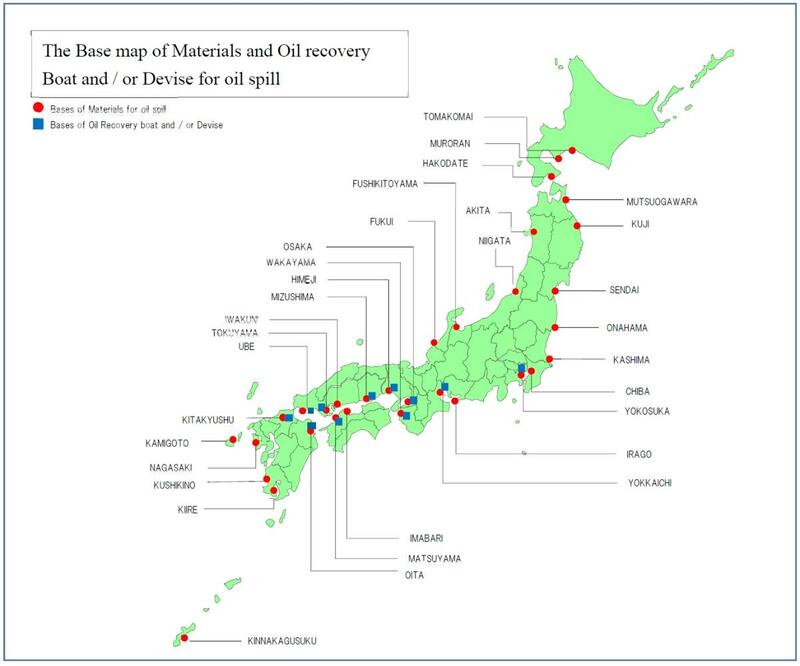 In Japan, the domestic law relating to the Prevention of Marine.Pollution and Maritime Disaster, when Specific Oil tankers over 150 GT navigate in the Applicable Areas, the Ship Owners thereof have legal obligation to prepare the Specific Oil Prevention Materials. Also, when Specific Oil tankers over 5,000 GT navigate in the Designated Areas, the Ship Owners thereof have legal obligation to deploy the Oil Removal Equipment.Please note that a failure to fulfill these obligations shall result in a fine of not more than 500,000 yen. ○ “Designated Areas” are sea areas prescribed in items 2 to 4 of Article 33-6 of the Regulation, or the so-called Tokyo Bay, Ise Bay and Seto Inland Sea including Osaka Bay (Article 39-4 of the Law, Article 39-9 of the Regulation). ○ “Applicable Areas” are the Designated Areas, ports pursuant to the Act on Port Regulations (excluding the Designated Areas) and Kagoshima Bay (the proviso of Article 39-3 of the Law, Article 33-6 of the Regulation). When Specific Oil tankers over 150 GT navigate in the Applicable Areas, the Ship Owners thereof have legal obligation to prepare the Specific Oil Prevention Materials. MDPC issues the Certificate of Specific Oil Prevention Materials Preparation which certifies that MDPC has prepared the Specific Oil Prevention Materials on behalf of Ship Owners. 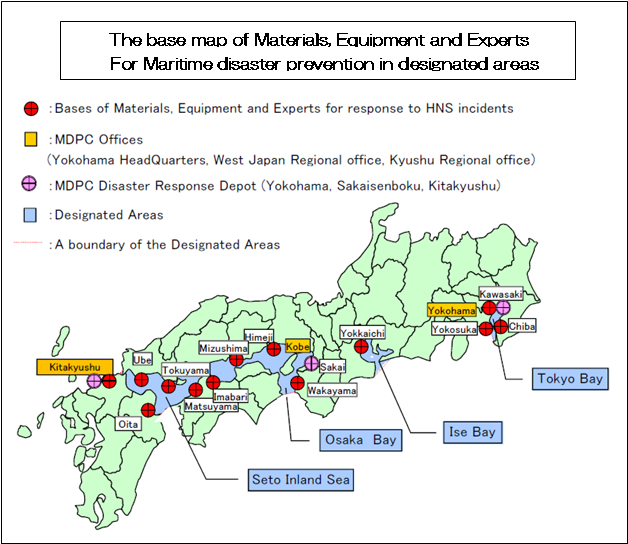 ※Please note that MDPC has so fardeployedthe Specific Oil Prevention Materials only at ports where large-sized Specific Oil tankers call, so that part of the Applicable areas are not covered by this service. In addition to the Designated Areas, the ports which are covered by the Certificate are as follows:-Tomakomai, Muroran, Hakodate, Mutsu Ogawara, Kuji, Akita, Sendai, Onahama, Kashima, Niigata, Fushiki-Toyama, Fukui, Irago, Nagasaki, Kamigoto, Kiire, Kushikino, and Kinnakagusuku. (ii)	Certificate of Oil Removal Equipment DeploymentWhen Specific Oil tankers over 5,000 GT navigate in the Designated Areas, the Ship Owners thereof have legal obligation to deploy the Oil Removal Equipment. MDPC issues the Certificate of Oil Removal Equipment Deployment which certifies that MDPC has deployed it on behalf of Ship Owners. MDPC will issue the Certificate with the Emergency Response service as of October 1, 2017. In case of a large amount of Specific Oil spill incident caused by marine accidents such as collision, grounding and so on within the Designated Areas, MDPC will immediately arrive at the incident site and take quick and appropriate response at the request of the vessel issued with the Certificate. ※ Please note that the Specific Oil spill during Ship-to-Ship Transfer operations (including preparation work therefor) is not covered by this service. ※ The Emergency Response by MDPC shall not be continued more than 24 hours after its start. When there is a possibility of exceeding 24 hours, necessary response measures shall be consulted among the relevant parties such as whether they will continue or terminate operations, whether they will shift the Emergency Response to Item-2 Operation provided in Article 42-14 of the Law or to operations by any third party entrusted by the Ship Owners and so on.